Look at these plump pumpkins which I spotted yesterday during a short walk. Sorry to disappoint you, my dear pumpkins, but I have never been one for Halloween or horror, for that matter. The one horror film that I ever watched in its entirety (something about people being invited to a mysterious film screening in a dodgy theatre in New York to then get their faces scratched by a mask and turn into zombies) left me unable to sleep for two weeks. Every time that I closed my eyes and managed to doze off, the visuals of the film would come to me in scary technicolour. Years later I watched the first ten minutes of the first ‘It’ and to this day I have a deep seated mistrust of any type of drains. I am not even willing to consider watching the second ‘It’ or read the book for that matter. is to read the ‘Let’s Not Meet’ sub-reddit and this has fed my anxieties so much already that if anyone walks behind me on the street, no matter how bright the sun may shine, I always turn around to check and let them pass me, albeit a sweet little Italian granny. So, yes, but no… I am not ready for Halloween and not quite looking forward to it. Although, the other day, I spotted some really cute headbands in H&M with spiders and bats attached to them. Had they not been kid’s size, perhaps, I would have gotten one, as they appealed to my sense of style. Irrespective of my feelings towards it, Halloween is making a quick and resolute marketing attack on countries which don’t really have the British-American ‘trick or treat’ tradition. I am not sure though how much candy you will be given, if any. For Halloween still seems to be more of a fledgling marketing event here and an excuse for kids to have a little dress-up party at nursery or at home. I mean, there are some truly terrifying places in Italy (like catacombs, ossuaries and this, at least for me, very scary, tiny and seemingly abandoned aquarium), but they are not used for cheap scares. And horror is not as of yet denigrated to a simple get-your-kicks-from event. Unless, of course, you exclude amusement parks, some of which have already set up their Halloween displays. A sweet or a joke! Please, notice that both words in Italian have been used in their diminutive forms which makes the saying much cuter. So, it doesn’t seem to have the same urgency, threat and a sense of obligation to it as its American English counterpart. This morning, I read this very interesting article in an Italian terminology blog about the rise of ‘Dolcetto o scherzetto!’. Being a linguist myself, I enjoyed the author’s attempts to trace its origins. Apparently, there was another Italian version of ‘Trick or Treat’ before it: ‘La borsa o il malocchio’. Meaning literally ‘The bag or the evil eye’. A slightly different form of it was ‘La borsa or la vita’ (‘The bag or your life). of the ‘Charlie Brown’ comic strips. Definitely click on the link above and read the article for more details and to see the respective cartoons. The article is in Italian, but it is easily understood if you don’t speak the language very well (just like me) or you can use Google Translate. Linguistic stuff aside, I would like to testify that for the last three Halloweens that we have spent in Vicenza, no-one actually rang our bell to shout ‘Dolcetto o scherzetto’. Thank God! As in true Halloween party-pooper style, I had not bought any sweets or chocolate to share. This year I will keep relying on Italian parents not to feel pressurised by films and marketing into taking their kids round the streets to collect candy. This way I can keep it all to myself as horror or not, a bit of chocolate is good any night of the year. Do you celebrate Halloween? Do you enjoy trick or treating? Let me know. P.S. By the way, did you notice how skillfully the three pumpkins in the photo above have been carved? I mean, Pennywise on the right-hand side is terrifying. But did you notice that the pumpkin in the middle seems to announce a pregnancy?! If so, congratulations to the happy couple! 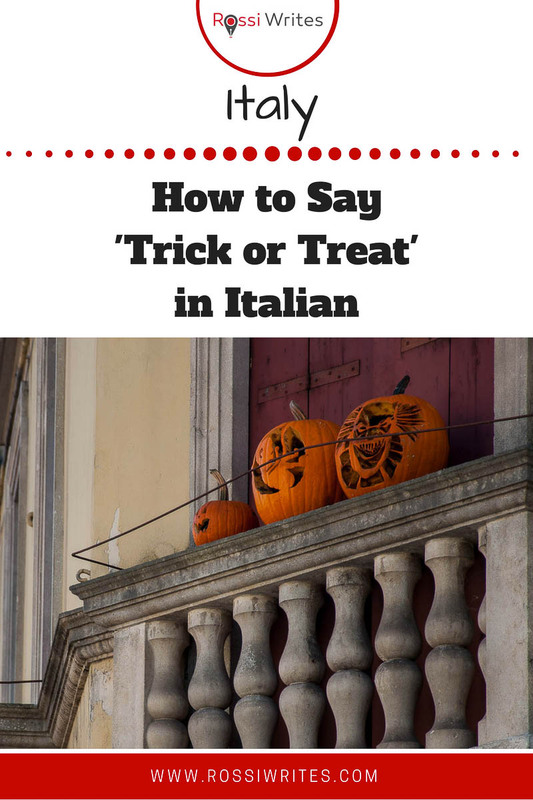 I really enjoyed your article on Trick or Treat in Italian.I am 100% Italian, USA BORN, Mom is from San Giorgio de Canavese,in Torino Prov. & my Dad is from Catobagli , Sassoferratto di commune, Ancona Prov. I know only a few words or phrases from my parents but being # 14, child, they were speaking more English, which I am sorry about. My husband is 100 % Slovenian and we have been back many times, Some of my children grand children are going to Slovenia this summer but I do not know if they will have time to do both countries this time. I wanted to say that when I saw the word , malocchio, I just laughed because the old folks used to talk about that a lot . Well I could go on but my husband is calling. Just enjoyed visiting with you for a short time. Stay well and Safe and Happy! Maybe Ill stop by again soon.